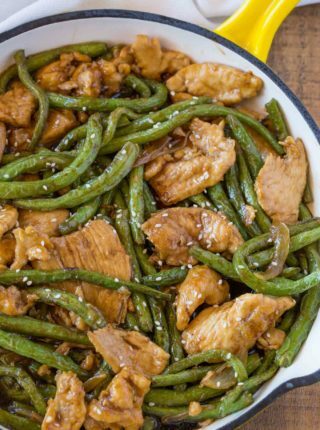 Chinese Green Beans are a buffet favorite for us. I always load up half my plate with these, then allow for just a small scoop of rice along with some sort of stir fry that’s available. The problem with most chinese buffet recipes is that they are normally made with large amounts of oil, frying almost everything. The green beans are no exception. In our case we steam the green beans before adding the oil, this allows us to mostly cook without the oil. 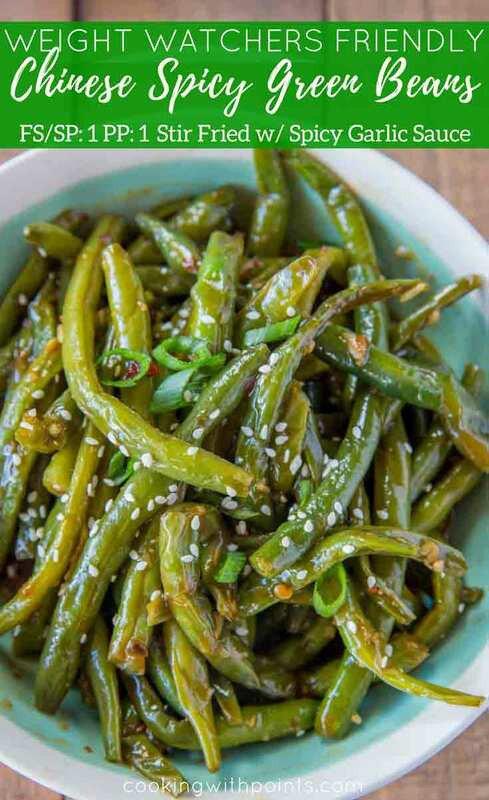 If you’d prefer to make these green beans 0 points per serving you could certainly leave out the oil, but adding the small amount we do (which makes these green beans just one point per serving) is great for helping to bloom the flavors of the garlic and the chili paste. Wash the green beans well, then line them up with the tougher, stem side ends all in row and slice off a half inch on the stem side of the green beans. There is no need to trim the tapered end of the green beans, it is tender enough to eat. If steaming, add to a steaming basket and cook for 4-5 minutes on high heat or for 3-4 minutes in a microwave covered with a dripping wet paper towel. If sautéing, steam for 3-4 minutes, then continue to cook in the skillet with sauce for an additional 1-2 minutes. Chili Garlic Paste: I always use this brand because the punch of flavor is awesome and it keeps in the fridge for a very long time. 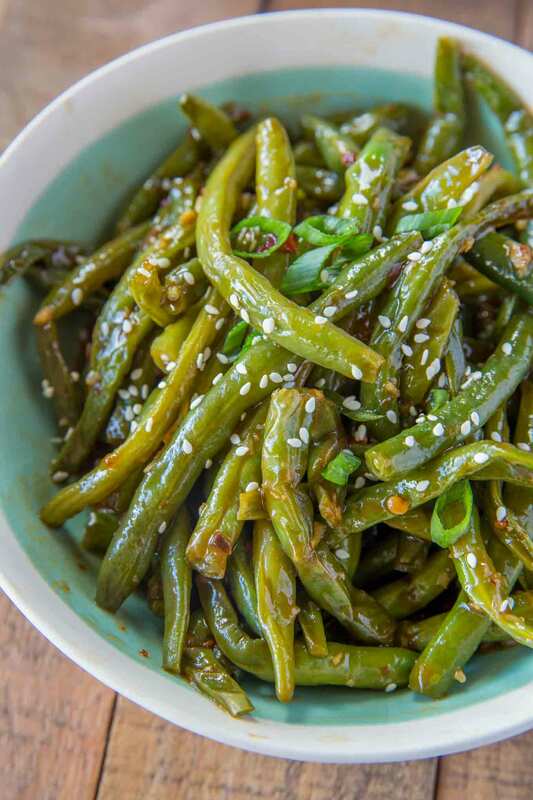 Skinny Chinese Green Beans just like you love from the Chinese buffet with a spicy garlic sauce but without the frying or excess oil. To a wok with a lid (or a steaming pot with a lid) add the green beans and 1 cup water on high heat. Steam for 3-4 minutes, then drain any remaining water and set green beans aside. Add the canola oil and heat on medium-high heat. Add the green beans and stir fry them for 1-2 minutes. Add in the garlic, green onions, chili-garlic paste and stir to combine. Cook the garlic mixture for 30 seconds to a minute then add in the soy sauce, rice vinegar, sugar, water and chili flakes. Cook for an additional 1-2 minutes or until most of the liquids are completely cooked off. I love new ways to make green beans! My husband is going to flip when he sees this on his plate tonight! They are his favorite!! All of the great flavors with none of the added calories! Winning! Perfect comfort food! Looks fantastic! Green beans are my FAVORITE! I want to try it immediately! 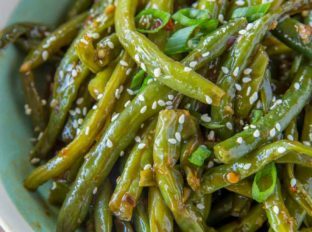 What is it about Chinese green beans…!? The best! 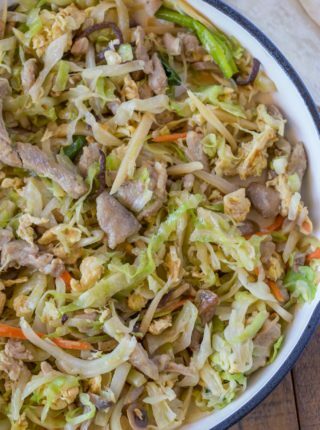 I love finding recipes that give me healthier versions of my favorite restaurant foods! These skinny green beans may become my weekly norm. They are mouth-watering! Thanks, Jenny! I love to hear when my recipes have become a weekly/frequent dish! It looks so good! 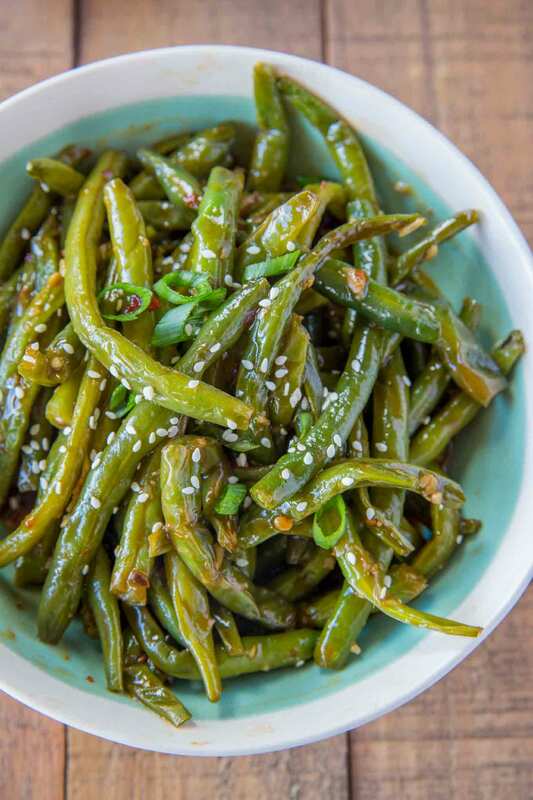 Such a great way to cook green beans! What are the ingredients/amounts? I can see everything in the recipe post except for the ingredients. The only one visible is the sesame seeds. 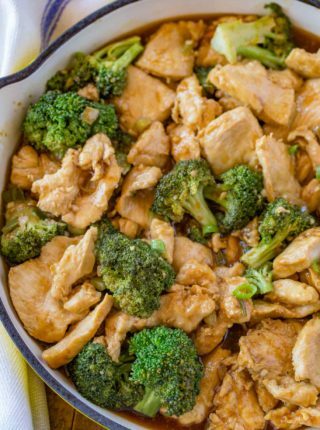 I’ve tried on multiple devices and browsers, and I would love to be able to make this recipe. Kat, thanks so much for catching this! The ingredients were removed by a glitch but they’ve been restored now. Sabrina what happened to the smart points for your recipes? I love your recipes and noticed they are gone. I didn’t get all the recipes printed off that I use, anywhere I can get the point values? Thank you in advance. Janealma, thank you for kind words about my recipes. Unfortunately, Weight Watchers has requested that I remove point values from my recipes. If you want to know the points for my recipes, you’ll have to use their recipe builder so that you get the full benefit of their 0-point ingredients.